Much like writing a letter to Santa, our society believes that if we write down our goals, they will magically appear. Success will come wrapped up in red-and-green paper, nestled under a tree of pine needles and money. But as you get older, you realize that Santa Clause was your parents, the Tooth Fairy isn’t a pink-winged lady with an unhealthy obsession with canines, and creating a list of this year’s resolutions won’t help you succeed. While the theory of goal setting has been around since the 1960s, experts agree that goal setting can often do more harm than good. It can lead to a lack of motivation, feelings of discouragement and low self-worth, unethical behavior and eventually, failure to succeed itself. Writing down your goals is only a reminder of what you hope to achieve—it’s a prescription waiting to be filled. If you want to hit the mark of success, you have to fill the prescription by making changes to yourself and your aspirations. 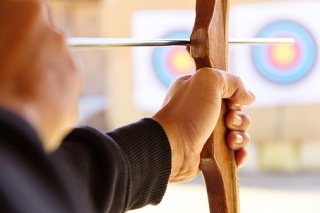 Here are 4 reasons why you may be having trouble achieving your goals and steps on how to improve your aim for success. Aspiring for the highest achievements is admirable, and why shouldn’t you be the best you can be? But when it comes to goal setting, you have a higher chance of success if you break your goals up into more manageable and achievable bits. When you set too high of a goal, fear of failure begins to creep in and you’re likely to return to more comfortable behaviors. Focusing on the smaller wins, instead of the bigger picture, motivates you to continue forward. If you want to be the next Donald Trump, seek out a local business owner that can mentor you on the ins and outs of entrepreneurship. If your goal is to get accepted into graduate school, learn new studying techniques to improve your current grades. Aiming for smaller goals will give you the practice you need to visualize and hit your ultimate shot. The path to success is just as important as the end destination. When you overly focus on a goal, you risk sacrificing your values and independent thinking to achieve it. Success is not just the mere attainment of goals, but also the attainment of skills and the personal growth you develop along the way. Maybe your goal was to improve your Spanish grades from a D to an A, but because you aren’t all that interested in learning Spanish you typed your paper into an online translator. Sure, you got a better grade because your sentences were conjugated correctly, but are you any better at Spanish than you were before? Instead of aiming blindly for achievement, turn your goal into a passion. Pick a goal that is not only easily attainable but one you actually want to attain. If you love movies, try watching Spanish flicks. Or just switch to learning a different language you’re more interested in. When you’re passionate about something, you’ll not only be motivated to achieve it but also want to achieve it the right way. Experts say that goal setting is only effective if it’s rewarding, positive and easy. In our culture, we define success as 100% and anything 99% or less is failure—we tend to focus only on the parts we aren’t achieving and never the small successes along the way. When you set a goal that isn’t attainable, possibly outside of your capability, you’re setting yourself up for failure, negative emotions and demotivation. If you’ve fallen too many times, sometimes the best option is to stay down and reevaluate your goal; the target may be too far away. If your company’s goal is to be valued at $5 million, but your sales team isn’t able to reach the $5,000 a month in revenue, you may need to start back at square one with retraining your staff in sales and customer service. Success requires change in your mind and body, and change can take time. Choose goals that are easy to achieve so you don’t lose the motivation to continue forward. Remember, failure does not mean you are a failure; there will be circumstances outside of your control that will prevent 100% success. Being laser-focused on your goals is one way to do it, but sometimes you miss out on opportunities because you’re too determined to stick to the plan. When creating your goal, leave some wiggle room for change and keep your eyes peeled for unique opportunities that may lead you to the same end. Attend networking events, utilize your own contacts and keep an open-mind when working towards success. Your path to graduate school may be through the professor you helped last semester and not in higher grades. You may be more adept at Spanish if you spend a few months in Costa Rica, and your sales team might need a better product to market to reach your goal. Keeping an open mind, creating a list of acheivable goals and staying on the honest path will help you succeed in life in the most unexpected ways!